The Creeper. Set to become a sure-fire favourite with trout anglers nationwide, this scary-looking attractor will out-fish all others, says Fred Bainbridge. The secret behind its success is movement, and with a wing of pulsating rabbit fur and a myriad of wriggling legs, it just can¹t help but dance attractively in the water. Fred takes a trip to newly-opened Curley¹s Fly Fishery in Lancashire where the Creeper reaps instant rewards! TFF brings you the ultimate guide to knots. Proven to have the highest strength by a massive margin, this ‘figure of eight’ style will cut those breaking leaders to an absolute minimum. These are ever so simple to tie and make creating droppers child¹s play, even adding extra movement to your flies. Read this and you WILL put more fish in the netŠ these are the strongest knots in the world! 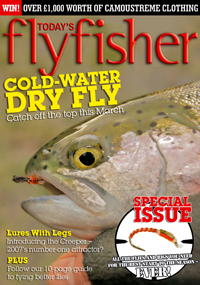 With an overwhelming array of fly lines on the market today, the modern angler can spend more time choosing a line than actually getting down to the business of catching fish. Top all-rounder Howard Croston explains that a floating line really is the only choice when it comes to a versatile approachŠ in fact it can be the only line you¹ll ever need. We join Howard at Wych Elm Fishery where he fishes from top to bottom with ease. It¹s the start of the season and rods are being dug out and fresh leaders tied to fly lines. But what fly do you choose? Whether you fish for rainbows on a small stillwater, wild browns on the Scottish lochs or Atlantic salmon on a roaring river, here¹s the only guide you¹ll ever need. Load your fly box with these patterns and follow the diagrams for the perfect leader set-ups, then go fish. Make this March your best ever!